ONE of the first, if not actually the first, of French designer-constructors to utilise the three-engine principle was M. Rene Caudron. ДальшеMore>>> At the Paris Salon of 1919 a very large machine incorporating this principle was exhibited. That machine was in several respects scarcely up to modern standards. For instance, the wing bracing was in the form of piano wire, a feature which came in for a good deal of criticism. Perhaps one would have been inclined to judge it less harshly had one been informed that, although its cabin was got up for "show," the machine was, from the practical point of view, intended not so much as a finished product as to provide a sort of flying laboratory, in which thorough tests could be carried out on the advantages or otherwise of three engines. Problems such as manoeuvrability with one wing engine out of action, and the ability to fly on two engines only, were among the problems attacked. For reasons of economy, everything was kept as simple as possible, among others the piano wire wing bracing. We understand, that some interesting results were obtained, and that, in a measure, the three-engined machine exhibited this year is the direct and practical outcome of these experiments. A number of very great improvements have been effected in the new machine, which is considerably smaller than was the 1919 type. For instance, the wing bracing is the now generally adopted streamline wire, and the detail design generally conforms more to modern ideas. The three-engined feature has been retained, so presumably the tests on the "C.25," indicated certain advantages. Apart from the question of reliability, there does not appear to be any reason to suppose that three engines offer any great improvement over two. The only exception is, perhaps, that of turning moment in the case of one wing engine stopping. It will easily be seen that, for a given power and with the wing engines spaced the same distance out from the centre line, the turning moment will be smaller by an amount corresponding to the difference in the size of the units into which the power is divided. Whether this advantage is sufficiently large to be of practical value is, perhaps, open to discussion. In any case, the effect of having three engines is merely to reduce the turning, it does not prevent it entirely. From the aerodynamical point of view, it is doubtful if there is any gain to be derived from using three engines. We believe that in the case of the three-engined Farman Goliath it was found that it made but little difference to the speed of the machine whether the central engine was on or off. This is not so surprising as it may appear at first sight. To begin with, fitting the central engine adds considerably to the weight of the machine. The slip stream from the propeller increases the fuselage resistance very materially, and, what with one thing and another, the gain in speed is inconsiderable. There remains then only the question of reliability as a reason for three engines, and carrying an extra engine is a rather heavy price to pay for reliability. The time should not be far distant when aero engines are so reliable as to render such drastic measures superfluous. As regards the Caudron "C.61," the machine shows much better detail construction than did the machine of 1919. Its general lines are also more pleasing, and altogether the machine impresses one as being a great improvement on the "C.25." The fuselage is an ordinary girder type, fabric covered, and projects a considerable distance out in front. One Hispano engine is placed in the nose, and just behind it is an open cockpit for the pilot and engineer. The view obtained from the pilot's cockpit is extremely good, owing to the cockpit being well forward, and to the comparative small width of the front portion of the fuselage. The cabin extends from the pilot's cockpit to some distance aft of the trailing edge of the non-staggered wings. Entrance to it is effected through two doors, one on each side The depth of the cabin is sufficient to give room for standing upright, but the seats, instead of being placed on the floor itself are mounted on the top of two raised platforms running one along each side of the cabin. The reason for this arrangement, which is not obvious at first sight, is that the tanks are contained in the fuselage under the platforms on which the seats are mounted. This is, perhaps, the most objectionable feature of the whole machine. At a time like the present, when every endeavour is being made to guard against fire on board, it does appear a direct challenge to fate to place the petrol tanks immediately under the seats of the passengers. Petrol vapours have a nasty habit of hanging about in the vicinity of tanks and pipes, and it is difficult to see how they could be prevented from escaping and mixing with the air in the cabin. Quite apart from any matches being struck by a passenger, the knocking of a boot against a screw or nail might conceivably be the cause of a spark, in which case an accident might easily occur which would seriously injure the cause which we all have at heart. For the sake of aviation in general, we would urge the Caudron Company to change the position of the tanks before the machine is flown. On the Spads, placing the tanks on the top plane appears to have proved satisfactory, and although this does not increase the beauty of a machine, it does undoubtedly add greatly to the safety from fire. The wing engines are placed on the side of the inner wing struts, and are further supported by tubes sloping out from the base of the struts to the outer engine bearers. The engines are not enclosed in any way, but possibly it may be the intention to add a cowling later. 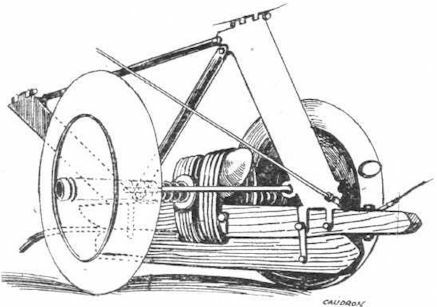 A four-wheeled undercarriage, consisting of two units of two wheels, is fitted This is of the short skid type, and one of our sketches shows how the rubber cords are wound around the skids and axle cross-piece to give even tension in the rubbers. A wood shoe under the rubbers prevents wear and tear against the ground. A fifth wheel is added to the undercarriage, in the form of a small wheel under the nose engine. One is somewhat doubtful as to the fate of this wheel, or at any rate its tyre, when the machine is swung around on the ground. As the passenger accommodation is for six only, and the total power is approximately 450 h.p., the power expenditure per passenger is about 75 h.p., which appears somewhat high. It may be, however, that the designers are counting on running the engines at half power normally, so as to prolong their life, in which case this should be taken into account when trying to assess the utility of the machine. A good margin of power is the best possible safeguard against accident, and nothing is more dangerous than an under-powered machine. However, in the case of the Caudron the excess of power appears to be unnecessarily great. Following are the main characteristics of the Caudron "C.61. ": Span, 79 ft. 3 ins. ; length o.a., 46 ft.; height, 13 ft. 2 ins. ; wing area, 1,120 sq. ft.; weight empty, 4,850 lbs. ; petrol, 970 lbs. ; useful load, 1,850; total weight, 7,670 lbs. ; weight per sq. ft., 6 85 lbs. ; weight per h.p., 17 lbs. ; speed near ground, 100 m.p.h. ; duration, four hours; range, 400 miles. The useful load includes 1 pilot and 1 engineer, 350 lbs., and six passengers with luggage, 1,500 lbs. No firm has a greater number of machines on view than the Caudron, six complete machines being shown, ranging from the old G.3 with skids and open tail girder to the three-engined passenger carrier, C.61. The G.3 is too well known to need any description here. Suffice it to state that it forms the first step in a carefully-graded course of instruction. From the G.3 the pupil goes on to the second school machine shown, the C.27, which is a two-seater tractor biplane with 80 h.p. le Rhone engine. Finally he is transferred to the C.59, a two-seater tractor biplane with 180 h.p. Hispano engine. There is nothing of special interest in either of these machines, which are plain, straightforward biplanes of usual design and construction. 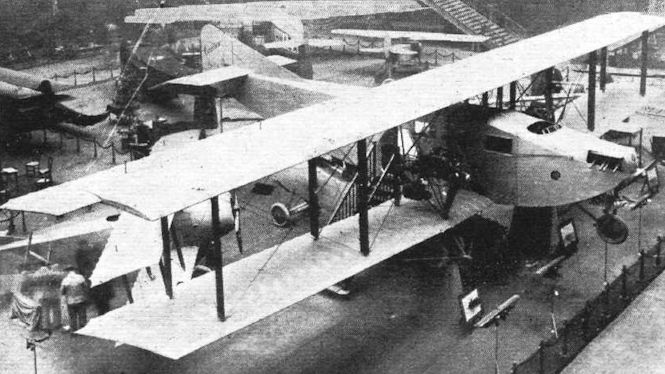 The three-engined C.61 is in the main similar to that shown last year, but certain improvements have been incorporated, chief of which is the placing of the petrol tanks in the top plane instead of under the passengers' seats, where their presence would have been a constant source of danger. The cabin of the C.61 accommodates eight passengers, and it is of interest to note that the lower portion of the fuselage is formed into a series (11) of watertight compartments sufficient to keep the machine afloat in case of a forced descent on the sea. Several of these machines have been bought by M. Latecoere for the Marseille-Casablanca route, which entails crossing the Mediterranean. As a matter of fact, with three engines, any two of which are capable of keeping the machine aloft, the chances of a forced landing on the sea should be very remote. Incidentally, it is not without interest to mention that, in addition to the six Caudron C.61 machines ordered by Latecoere, two more were purchased on December 19 by another firm. We wonder if any other firm can show similar results. The only other new machine on view, and of that only the front portion of the fuselage is shown, is the Caudron C.81, a very large three-engined cabin machine. It may be remembered that this is a type which has long been a favourite with the Caudron firm, having been produced in various sizes and with different power plants. In view of the fact that we on this side of the Channel are now beginning to turn our attention to the three-engined machine, it is of interest to remember that M. Caudron can probably claim the distinction of having first introduced the type in the form in which it is now generally employed, i.e., with one engine in the nose of the fuselage and one on each side on the lower plane. The C.81 is provided with a very large saloon, and a large placard on the stand announces that the machine flew, in November of this year, from Paris to Moscow with landings at the following towns: Strasburg, Prague, Warsaw, Vilna, Minsk, and Smolensk. The three-engined Caudron has the pilot's seat in front of the cabin. The Caudron three-engined machine, photographed from the gallery. 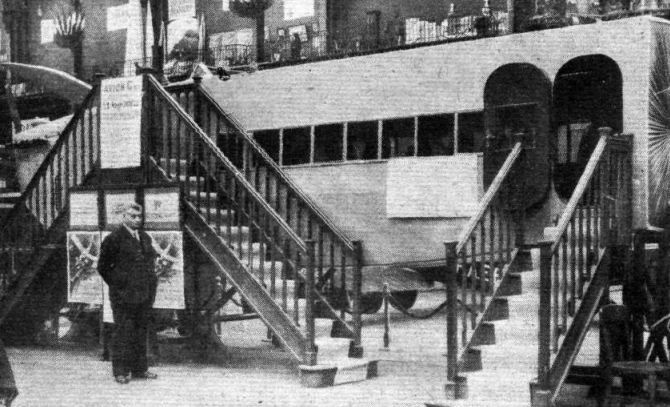 This photograph does not show the grand staircase, but illustrates the large cabin exhibited on the Caudron stand. This machine has flown from Paris to Moscow. 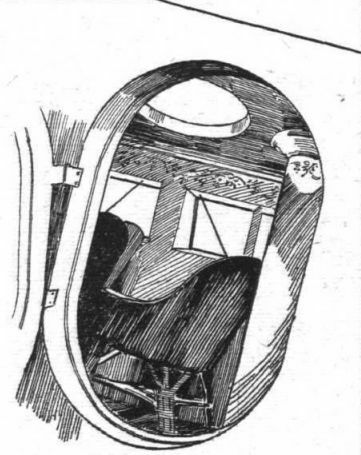 A peep into the cabin of the Caudron three-engined machine. THE CAUDRON UNDERCARRIAGE: One of the skid undercarriages of the "C.61." Note the arrangement for giving equal tension in the various rubber cords, and the skid below, which protects the rubber against wear.